There are several moments at which one might realize The Snowman is a special sort of bad movie, that it belongs to a strain of ineptitude rarely bought for $35 million these days. One might realize this when — after 45 minutes of piecing together the titular serial killer’s seemingly ideological motivation for dismembering several Norwegians — his investigators toss out a theory that seems solely obliged to the movie’s title: What if he only killed when it was snowing, you guys? One might realize this when Detective Harry Hole (Michael Fassbender), who’s been sleeping stone-drunk outside in the Oslo winter for several consecutive nights, decides to spend an evening in his fairly nice apartment listening to his vast vinyl collection while supine on the floor. But one simply must realize something’s not right with The Snowman when Val Kilmer (of all would-be reclamation projects) shows up in a hastily announced flashback. He looks ready to keel over, and all of his lines are overdubbed in a voice that sounds nothing like Val Kilmer’s. While director Tomas Alfredson’s moody depiction of Oslo as a lantern-lit snowglobe goes a little ways toward hiding The Snowman’s incoherence, rest assured it will eventually dawn on you. And when it does, you will wonder about issues big and small: Why did Chloe Sauvigny play twins in that scene that didn’t amount to anything? Why was that one guy outside with no coat? 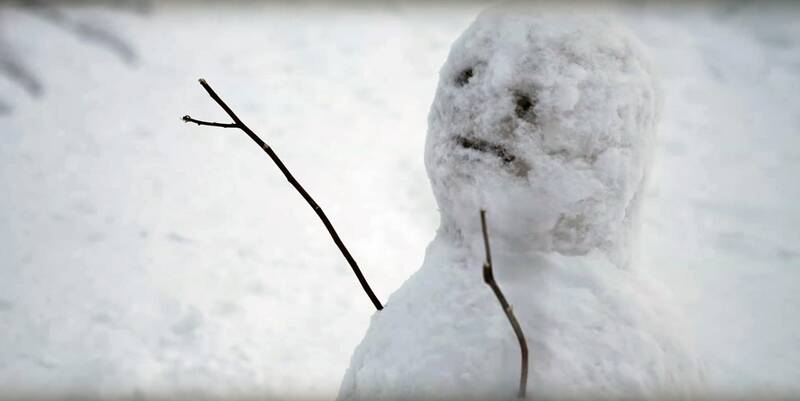 Why, uh, snowmen anyway? It’s trash, but not trashy. Moments of lunacy aside, The Snowman banks everything on the oldest, tiredest, so-hard-boiled-that-egg-don’t-even-crack noir cliches: the drunk, once-great detective, the optimistic rookie cop attracted to him regardless, the detective’s ex-girlfriend whose only job is to find peril in the end, the police chief who can’t cover for the detective much longer, the wealthy and powerful mystery man in town. Out the same month in which Netflix’s Mindhunter asks its viewers to constantly reevaluate the ethics and usefulness of our serial killer fascination, The Snowman heads off why most viewers even enjoy the genre in the first place. The film’s opening scene reveals the moment that broke the killer as a child: his mother takes her own life after being abused and abandoned by the boy’s neglectful father. It’s like the old adage goes: if you’re gonna make a movie about a murderer who builds snow monuments to each victim, never leave the audience interested in his motivation. This is the sort of incurious approach the film takes with every character, freezing the actors from each other. Gifted a cast of Fassbender, Rebecca Ferguson, Charlotte Gainsbourg, Sauvigny, Toby Jones, J.K. Simmons and the artist formerly known as Val Kilmer, the script isn’t even a little inquisitive about how any of the characters might impact or reveal each other. That fact is particularly glaring when it comes to Detective Hole and the women in his life. (Did I just type “Detective Hole and the women in his life”?) His partner (Ferguson) and ex-lover (Gainsbourg) like him despite the fact that he’s impossible to have a conversation with. He’s apparently too haunted to even strike the required pose of liquored-up machismo. And haunted by what, come to think of it? Seasonal affective disorder? We never even learn why he’s so unreachable; he just is. A lot of things about this adaptation of Jo Nesbø’s 2007 novel just are. I’m not here to ruin it more than it ruins itself, but there’s no reason for the killer to build snowmen, other than snow is highly available and it’s a creepy idea. The holes in this movie (Hole among them) are the kind that just glare at you as the mystery sputters along. A pulpier tack might cause you to shrug at some of the same technical flaws. For instance, imagining Renny Harlin’s The Snowman is fun. But no, what we actually got is oddly conservative for a movie in which multiple people are violently decapitated. Tomas Alfredson (Tinker Tailor Soldier Spy, Let The Right One In) is too good, or maybe just too serious, for the material and renders it ultimately worse than a wilder, less skilled director might. Some folks might tell you The Snowman is bad-good. I think they might be having genuine fun dissecting how bad the movie is, but the film itself is not chaotic enough to earn entry into that category. For bad-good, I’m going to need more people to actually yell, “It’s him! It’s the Snowman!” These are my terms, Mister Police.